You will need a base ready for when we deliver your log cabin. We will start building straight away as the parts are unloaded. We have all the tools that we need but it is useful if we can have access to electricty. 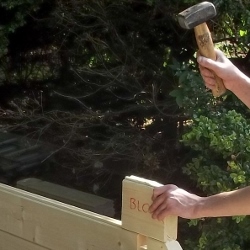 The price of constructing our garden log cabins includes all the fixings so you do not need to buy anything extra. You will have been given an approximate timescale for the construction of your log cabin. Sometimes it is completed sooner i.e if we bring extra workers. Sometimes it can take a little longer for example, if the weather is bad. Our construction team have pride in their work and won’t cut corners.